60 Commonwealth is located on the south side of Commonwealth, between Berkeley and Clarendon, with 58 Commonwealth to the east and 62 Commonwealth to the west. 60 Commonwealth was designed by Snell and Gregerson, architects, and built ca. 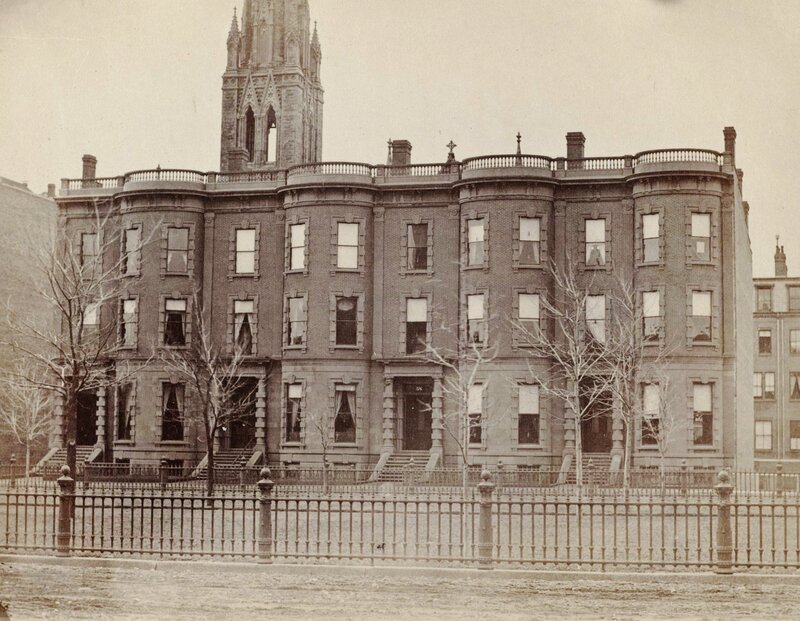 1866, one of four contiguous homes (54-56-58-60 Commonwealth) built at the same time in a Georgian Revival style, with bow fronts and balustraded parapets above the main cornice. 54 Commonwealth was demolished in 1936 and 56 Commonwealth was demolished in 1930. 60 Commonwealth was built as the home of Judge John Phelps Putnam and his wife, Harriet (Harriette) (Day) Putnam. They previously had lived at 97 Boylston. John Phelps Putnam purchased the land for 60 Commonwealth in two transactions. On January 17, 1866, he purchased a lot with a 26 foot frontage from the Commonwealth of Massachusetts, and on January 29, 1866, he purchased a lot to the east with a 22 foot frontage from banker and broker Robert Marion Pratt (this lot was the western portion of a lot which Henry Sayles had purchased from the Commonwealth on December 12, 1865, and then sold to Robert Pratt). John Phelps Putnam kept the lot he purchased from Robert Pratt and the western four feet of the lot he had purchased from the Commonwealth, and sold the remaining 22 foot lot (where 62 Commonwealth would be built). Click here for an index to the deeds for 60 Commonwealth. When 60 Commonwealth was built, the western party wall was constructed further west than appropriate and, as a result, the boundary line between 60 and 62 Commonwealth did not run through the middle of the wall. 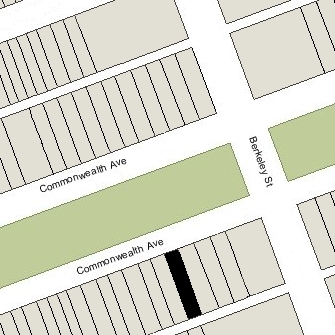 On December 1, 1871, John Phelps Putnam acquired a strip of land 2 inches wide from Henry Bigelow Williams, who was building a townhouse at 62 Commonwealth, so that the party wall would be rest equally on both lots. The Putnams’ three surviving children – Katharine Day Putnam, Annie Putnam, and Ellen (Nellie) Day Putnam – lived with them. Annie Putnam married in June of 1871 to architect Robert Swain Peabody, after their marriage they lived in the Longwood district of Brookline. Katharine Day Putnam died in February of 1875. Harriet Putnam’s nephew, Robert Day Andrews, also lived with them from about 1875. He was a student at MIT and then draftsman in the offices of Henry Hobson Richardson. He moved to Albany, New York, in the late 1870s, but was living with them again by the early 1880s. John Phelps Putnam died in January of 1882, and Harriet Putnam and their unmarried daughter, Ellen Day Putnam, moved to the the Hotel Vendôme. By the 1885-1886 season, they were living at 355 Marlborough. Robert Andrews moved to 6 Beacon, where he also maintained his architectural offices with Herbert Jaques in their newly-formed partnership, Andrews and Jaques. 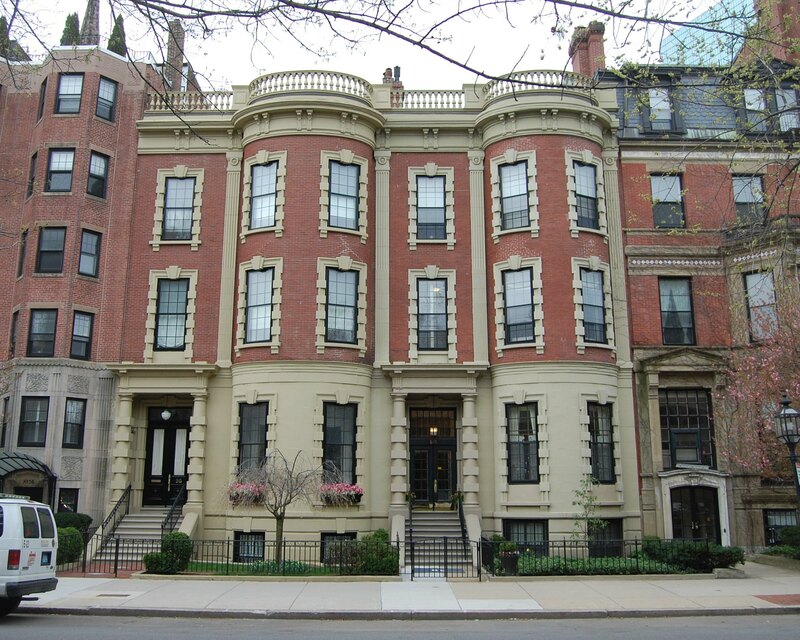 By the 1882-1883 winter season, 60 Commonwealth been leased from Harriet Putnam by William Gurdon Saltonstall and his wife, Josephine Rose (Lee) Saltonstall. They previously had lived in Salem. Formerly an East India merchant, he was treasurer of several cotton mills. By the 1884-1885 winter season, the Saltonstalls had moved to their newly-built home at 30 Fairfield. On November 13, 1884, 60 Commonwealth was acquired from Harriet Putnam by Annie (Grant) Allen, the wife of hardware dealer George Allen. They previously had lived in Newton. They continued to live at 60 Commonwealth during the 1885-1886 season, but then again made their home in Newton. On November 5, 1886, 60 Commonwealth was purchased from Annie Allen by cordage merchant William Bull Sewall. He and his wife, Lena F. (Ingalls) Sewall, made it their home. They previously had lived at 26 Brimmer. William Sewall died in December of 1900; Lena Sewall continued to live there until about 1906, when she traveled abroad. 60 Commonwealth was not listed in the 1907 Blue Book. On March 16, 1907, 60 Commonwealth was acquired from the estate of William Sewall by wholesale jeweler David Crowell Percival, Jr. He and his wife, Jennie F. (Bessie) Percival, made it their home. They previously had lived at 486 Beacon. They also maintained homes in Marblehead Neck and Sandwich. The Percivals’ son-in-law and daughter, Herman Parker and Lillian H. (Percival) Parker, lived with them. Herman Parker was a retail clothier in the firm of Macullar, Parker & Co., founded by his father, Charles Wallingford Parker. 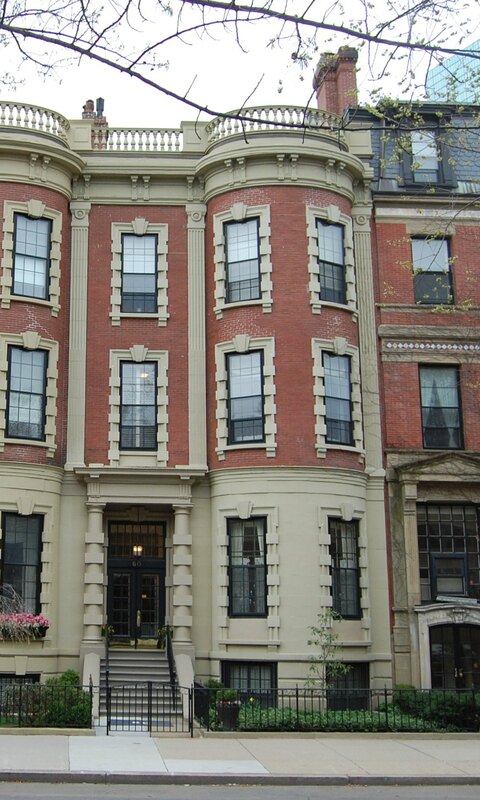 The Parkers had lived with the Percivals at 486 Beacon. David Percival died in January of 1913. Jennie Percival and the Parkers continued to live at 60 Commonwealth. By the 1915-1916 winter season, they were joined by David and Jennie Percival’s son, Lawrence French Percival, and his wife Evelyn H. (Joyce) Percival. He was a wholesale jeweler in his father’s firm. They previously had lived in Brookline and also maintained a home in Marblehead. Jennie Percival, the Lawrence Percivals, and the Parkers continued to live at 60 Commonwealth until Jennie Percival’s death in December of 1928. By 1930, the Lawrence Percivals were living at 73 Beacon and in Marblehead, and the Parkers were living in Marblehead. The house was not listed in the 1930-1937 Blue Books and was shown as vacant in the 1930-1936 City Directories. On March 14, 1935, 60 Commonwealth was acquired by William Bradford Sprout, Jr., of Hingham. In January of 1936, he applied for (and subsequently received) permission to convert the house from a single-family home into a six-family dwelling. In March of 1936, he amended his plans to increase the occupancy to eight apartments. On May 11, 1936, 60 Commonwealth was acquired from William Bradford Sprout, Jr., by real estate dealer Wallace Raymond Marden. He and his wife, Marjorie Lewis (Maclary) Marden, lived in Hingham and he maintained his office at 501 Beacon. On October 23, 1940, he transferred the property to himself as trustee of the Investment Realty Trust, and on August 30, 1943, he transferred it to his sister-in-law, Helen Elizabeth (Maclary) Baader, the widow of Albert Stanley Baader, as trustee of the Holden Realty Trust. The property changed hands and on October 16, 1945, was acquired by Mutual Associates, Inc., of which Irving W. Boyer was the president and Samuel M. Lewis was the treasurer. 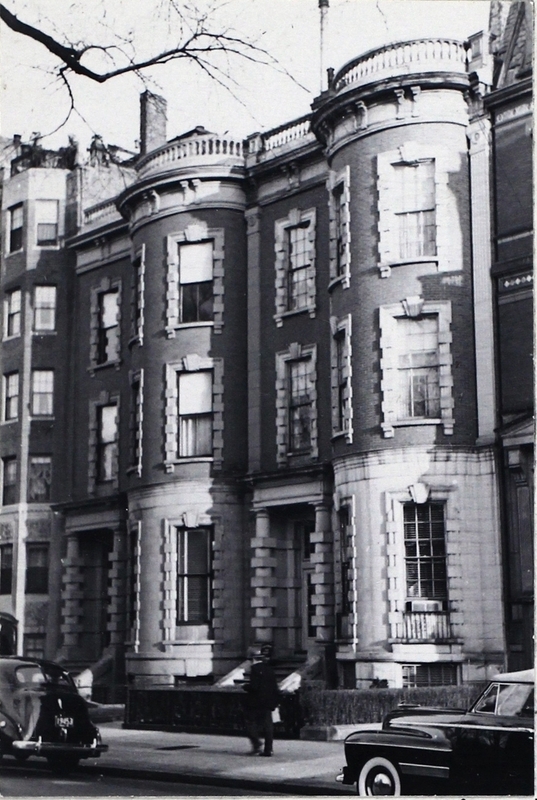 Irving Boyer and Samuel Lewis also owned 56 Commonwealth, which they transferred to Mutual Associates in November of 1945. Irving Boyer (Israel Levine) and his wife, Nellie (Raphael) Boyer, owned The Sheraton Shop, a furniture store at 717 Boylston. They lived in Newton. Samuel M. Lewis was a manufacturer; he and his wife, Sally E. (Kramer) Lewis, lived in Chestnut Hill. On June 1, 1959, Mutual Associates transferred 56 Commonwealth and 60 Commonwealth to Irving Boyer and Samuel Lewis, and on the same day it was acquired by Southeast Management Corporation. On July 1, 1971, Southeast Manager Corporation liquidated its assets and transferred 56 Commonwealth and 60 Commonwealth to Robert Gordon and Lola Jacobson. Robert Gordon was treasurer of Southeast Management. On August 1, 1974, both properties were acquired by Norman G. Gear, trustee of the 56 and 60 Commonwealth Associates Trust. On September 30, 1974, he converted 60 Commonwealth into eight condominium units and 56 Commonwealth into 28 condominiums. Although separate buildings, with a building between them, the two buildings were converted into a single condominium: the 56 and 60 Commonwealth Condominium.